These are a great addition to any sack lunch, make them in big batches and freeze them for convenience. Preheat oven to 350 F. For crust, mix together 2 cups flour, 2/3 c brown sugar, and 1/2 cup walnuts; blend in melted butter until crumbs form. Press into 2 greased (or foil) 9x13 inch pans. Bake for 10 minutes until light golden brown. Meanwhile in a large bowl, beat eggs until fluffy. Gradually add 1/2 cup sugar and 1 1/2 cup brown sugar then stir in vanilla. 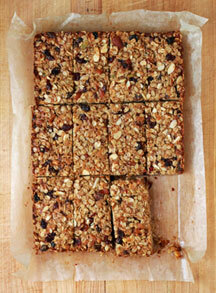 Add flour, baking powder and salt, and then add the dried berries, nuts, coconut, and granola. Pour over partially baked crust and bake for 20 to 25 minutes longer, or until bars are set. Cool for about an hour then cut into bars and roll in or sprinkle with powdered sugar if desired. Slice and place in zip top freezer bags or wrap bars individually in plastic wrap for lunchboxes.